The phrase seeing is believing doesn’t just apply to supernatural phenomenon; biochemists often say the same thing when imaging proteins or other molecules for the first time. Imaging is a powerful tool in many biochemists’ repertoire. The Department of Biochemistry at the University of Wisconsin–Madison is home to a large collection of equipment and facilities, including the Biochemistry Optical Core (BOC) and upcoming UW–Madison cryo-electron microscopy (cryo-EM) facility, that allows scientists to pursue their many imaging endeavors. The department’s goal is simple: to provide faculty, researchers, and students from the department and all across campus with access to these resources and the training to operate them, even if they’ve never used them before. Elle Kielar-Grevstad, the director of the BOC and supervisor to the department’s core facility staff, serves to promote and facilitate the department’s mission by helping researchers with their light and fluorescent microscopy needs. Imaging provides something very important in molecular biology, cellular biology, and biochemistry: context. While laboratory techniques in a test tube can measure the reaction of an enzyme of interest, what imaging provides is the context of where that reaction is taking place within an organism or within a cell. This can lead to a richer understanding of a biological process, which can then lead to the development of new products, tools, drugs and treatments. Researchers in the Department of Biochemistry as well as the Department of Biomolecular Chemistry utilize the facilities often. The two departments make up the joint graduate program, the Integrated Program in Biochemistry (IPiB). The lab of biochemistry professor Tom Martin studies the process of vesicle exocytosis, where tiny structures, or vesicles, in the cell exit through the plasma membrane. BOC microscopes allow him to see what’s taking place on the cell surface via live cell imaging, a powerful and important technique. 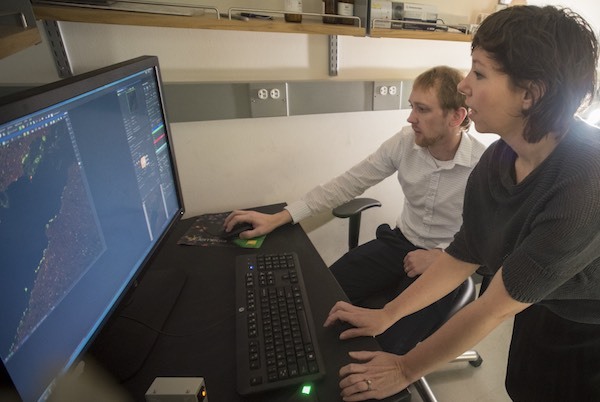 Among many other users, Professor Sebastian Bednarek uses imaging to get a look at trafficking pathways in plants at the cellular level, while the lab of Professor Alan Attie images insulin-secreting beta cells involved in diabetes. Scott Messenger, a postdoctoral researcher in the Martin Lab in Biochemistry, is a frequent user of the optical core. He studies cancer cells and how they communicate with other cells. In particular, he focuses on a process where a cancer cell takes a tiny membrane structure and delivers it to another cell, where that other cell may take it up and become a cancer cell itself. He adds that the microscopes allow him to take a focused view of the plasma membrane but also a deeper view of the entire cell to see the structure forming inside the cell and making its way to the membrane to be released. Without this type of information, researchers can’t begin to think about how to disrupt this process and pursue this avenue of cancer treatment. These images were taken on Biochemistry Optical Core instrumentation. The history of a shared imaging facility in the department goes back to a commitment the UW–Madison Department of Biochemistry made in 2012 to invest in expanding its imaging capabilities. Five years ago, Martin worked to encourage this investment. He believed that the next wave of research in biochemistry would be performed under microscopes where scientists can directly visualize single protein molecules, their interactions with one another, and how they perform their roles in cells. Out of this initiative, the BOC was formed and Kielar-Grevstad became its first director. Under Kielar-Grevstad’s direction the BOC’s impact has gone beyond the department and IPiB. Across campus, Kielar-Grevstad assists scientists from numerous disciplines — about 173 different researchers from 71 faculty members labs in 23 unique departments across five colleges overall. Kielar-Grevstad says her day-to-day work is always interesting, pulling from many different disciplines. She works to cultivate a community where a diverse cross-section of researchers uses the instruments in slightly different ways to address very different questions. She tries to push scientific boundaries by providing a platform to share knowledge across those disciplines. Kielar-Grevstad’s hope is that all researchers at UW–Madison — especially students — know they can come to the core facility staff members for assistance with imaging or instrumentation needs, even if they’ve never used that equipment or technology before. Kielar-Grevstad adds that this open access, community building mission will be especially important because the new high-resolution cryo-EM instrument — expected to be in place in late 2018 or early 2019 — will help open new avenues for obtaining advanced structural biology data. The department has ensured this mission with the hire of a cryo-EM technical expert, Desiree Benefield, who joined the department in September 2017.